Welcome Jenni. 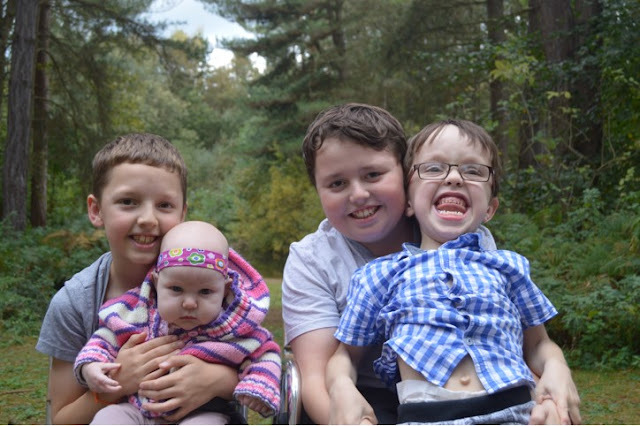 Jenni is full time mum & carer to 4 kids – 2 with additional needs. She is profoundly deaf herself so has her own challenges. Jenni blogs to help her sort out whatever is going on in her head!! Something I can really relate to! Thank you for taking part in the series. 1. When did you first realise your child has something wrong? When he was 11wks old and on a routine visit to the Health Visitor. I expressed some concerns on how floppy he was and by the end of the appointment HV & GP had made an urgent referral to hospital and our journey started in trying to get a diagnosis. With my second child I was told that she had failed her newborn screening so we were referred for more testing and as the weeks went on I began to realise that maybe the test was right that she had a hearing loss. 2. How did you feel when you found out that your child had issues? Scared, worried about the future, confused to why the doctors couldn’t give us a diagnosis. When I found out my second child was deaf I was so upset. I know how hard it can be with being deaf myself and with having 3 hearing children already I was so shocked to find out she was deaf. At first no one as we had no confirmed diagnosis...then my mum came across an article in the paper about a child who was classed as a SWAN – Syndrome without a name. I joined the FB group and finally got the help and support I had been looking for. With my second child we were referred immediately to various departments but I didn’t turn to anyone really as I withdrew from the world to get my head round the fact that I had a second child with additional needs. 4. What advice would you give a parent who suspects or has just found out that their child has additional needs? For parents who find out their child has an undiagnosed condition they should register with swan to get immediate support. For parents who find out that their child has a hearing loss they should contact NDCS who have a wealth of information of what to expect in the coming weeks, what support is available in their area. 5. What exactly is SWAN/Deafness? Syndrome without a name is basically a term given to children who have a range of symptoms but aren’t connected so they say its a completely new syndrome or something very rare that cannot show up in normal testing. There are 5 different levels of deafness– mild, moderate, severe, profound & total. My child has a profound loss. With my daughter it is again: making sure that we get the support she needs for her development with having a hearing loss, ensuring that we get the right equipment for her to enable her to hear. Our teacher of the deaf who visits the house every 2 weeks has been a great help in advising us what to do..
8. What has surprised you the most about raising a child with an undiagnosed syndrome/deafness? In raising a deaf child I realised how much everything revolves on sound. In the car when she is crying I cannot reassure her with my voice like I did with my boys because she cannot hear me, she gets scared easily especially if someone comes up behind her. 9. What’s the main bit of/the best advice you’d give another parent who has a child with undiagnosed syndrome/deafness? Make sure you join NDCS as you will get to meet others in the same situation..if you have any questions during the various appointments ( there are a lot in the first few months) don’t be scared to ask no matter how silly you think it is. Also to make sure they wear their hearing aids all the time so that they become so used to them that you wont have issues when they get older. Its not an easy life, full of challenges, many ups and downs but as long as you keep smiling, and make life great you can face anything in your path. Accept that there will always be ignorance from some people but don’t let it get you down , instead educate them and make them realise that nothing is perfect. You learn to apprieciate every thing no matter how small it is. Jenni's blog, Rainbow Dust, originally started about her son who is undiagnosed but she now also blogs about his younger sister who has mild delays and was diagnosed as profoundly deaf.